Hard Surfaces is a new trade show for 2019. Co-locating with the Natural Stone Show on 30 April, this show highlights the latest products and trends in the rapidly developing field of hard surfaces. Trend-Monitor talks to Richard Bradbury, Managing Director of QMJ Group the show organisers, about the reasons behind the decision to launch a new trade show. TM. Tell us about the changes in the market that have led to the launch of the new show. RB. Many sectors of the stone supply industry no longer supply natural stone only. It started with engineered quartz – Silestone, Caesarstone, Radianz – that the granite kitchen worktop suppliers added to their palette, albeit reluctantly at first but later with enthusiasm as it grew the market for them. Quartz is cut and worked on the same CNC saws and work centres as granite worktops. Once their initial reluctance had been overcome, many found the move into other products easier and the same stone companies now encompass glass products and the new ultracompact surfaces, such as Dekton, Lapitec, and Neolith. Others have encompassed porcelain products, which now come in large-format sheets. Some have also taken on board products such as Corian and Hi-Macs, although these are used in different ways and are often thermoformed. When they bought thermoforming equipment they found quartz can also be bent in this way. Although hard statistics are not available, market sources are clear that quartz alone has at least doubled the kitchen worktop market for companies that were originally granite worktop processors. TM. How has technology influenced the surfaces landscape? RB.The expansion of the range of products used has grown the market, with hard surfaces taking – and continuing to take – market share from laminates in the worktop sector, where laminates still account for about 80% of installations, so plenty to go for. TM. When it comes to kitchen and bathroom design, what are the key emerging trends? RB. Quartz is the big mover, although ultra-dense surfaces and porcelains are growing. People like the look of white marbles in their kitchens and bathrooms but, in kitchens in particular, marbles present problems because they are relatively soft and, being essentially calcium carbonate (limestone), react with acids. There are a lot of acids in food and they can stain and etch marble unless it is well protected. Man-made products overcome this problem. There is also the growing trend for industrial chic – the look of metal, concrete, and wood that has spent the past century in a factory. The real materials could present hygiene and processing problems. Man-made quartz or ultra-dense products achieve that look without the problems. TM. 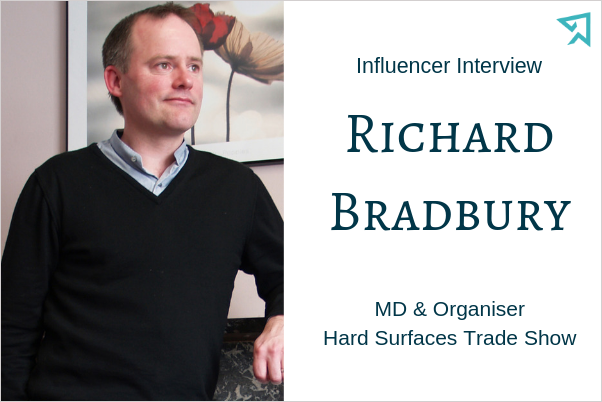 Are there any wider social trends that are influencing consumer buying behaviour when it comes to surfaces? RB. In the consumer market, which is where many of the more innovative surfaces are used, people tend to modernise or upgrade when they move, so house sales make a difference. Kitchens are a significant element of the living area of houses these days, used for so much more than simply food preparation. Bathrooms, too, have become more about fashion statements in recent years. People want hard surface worktops. They want tiles on the walls and floors, both natural stone and man-made. They like behind-tile heating and the thermal mass of stone and porcelain make it efficient. With the Government committed to increasing new builds to 300,000 units a year and there being no indication that the desire for natural and engineered stone horizontal and vertical surfaces is diminishing, I think we can be fairly certain that the growth in this sector has some way to go yet. TM. What can visitors to the new show expect to get out of it? RB. While the Natural Stone Show is still the main event, it was decided to create the new show to highlight all the new materials now available . As well as the exhibitors, we are including a feature in Hard Surfaces called Innovation Meets Design. It is being curated by MaterialDistrict – probably the world’s leading match-making platform for innovative materials – and will include 136 innovative surfaces. These are hard surfaces at the cutting edge, and most people will never have seen them before. We hope they will excite and inspire designers and fabricators.